How do I get started with bento? So long, and thanks for all the cupcakes! 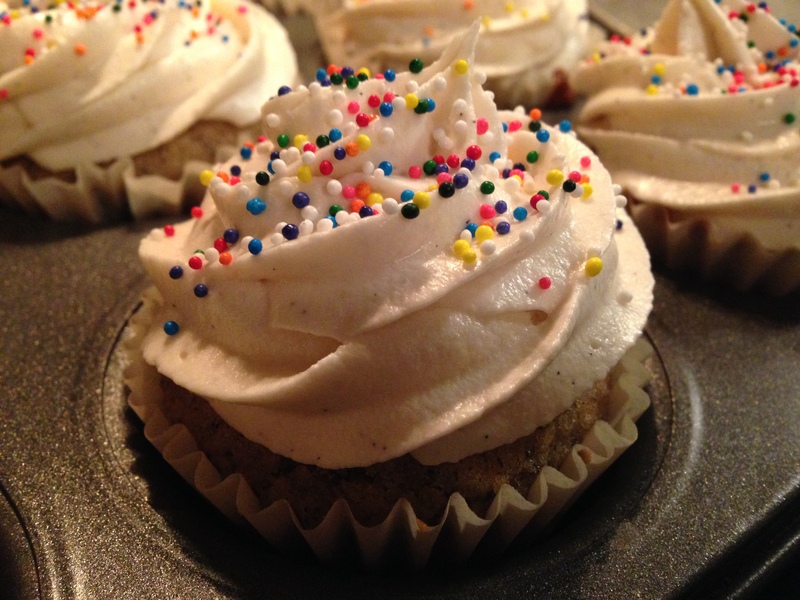 GF vanilla cupcakes with vanilla bean icing. These cupcakes were for my best friend and cupcake cult founder’s housewarming, so what else would I possibly even think about bringing? You know you’ve nailed gf baking when a cuppie appreciator didn’t know they’re gf and says it’s one of the best cupcakes she’s ever had. Then I revealed the deep dark secret, and she was very surprised. I haven’t posted this week since the lentil soup bento, because I took that to work with me each day until today. 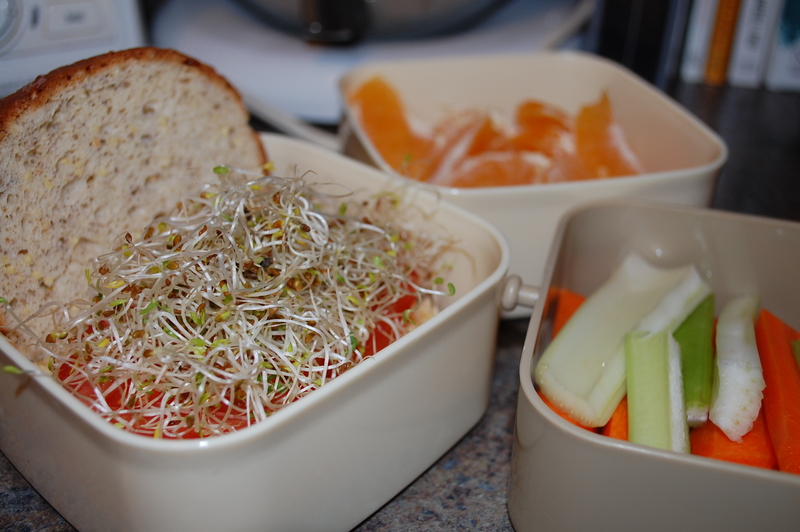 I was getting a bit bored with it, so I made a Havarti, tomato, mustard, and sprout sandwich on gf millet chia bread, some carrot and celery crudités, and an orange. The only problem was that there was so much food I had a hard time finishing it on my lunch break. 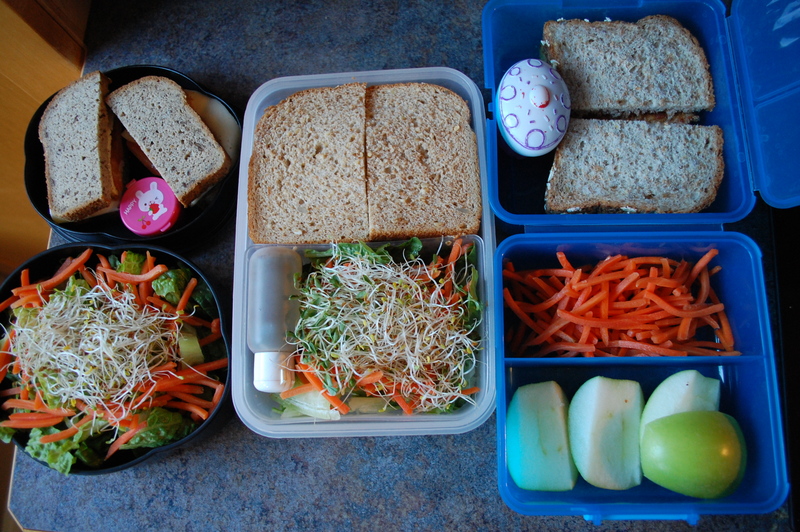 Sneaky awesome thing about being gf: the bread is generally so tiny it fits really well in bento boxes! I left the top off the sandwich for the photo before popping it on the sandwich, but didn’t need to play lunchbox tetris, as it’s the perfect size. My morning snack was a berry and kale smoothie, and my afternoon snack was an apple. Deelish! There are some things that are great about the weather getting cooler… you get to make soup and want to reheat it for lunch. On the other hand, by the time you get around to making the soup and putting it in a bento it’s now dark and hard to get an appetizing photo of the food. If I got up in the morning to pack the bento, it wouldn’t make much of a difference, as I’m at the time of year where it’s dark when I leave the house, and getting dark when I start to come home (some days, depending on how much prep or paperwork I need to get done). I have some lentil soup, greatly adapted from Gordon Ramsay’s Healthy Appetite cookbook, although you can go ahead and make the recipe as is and be quite happy with it. Hubs bought me a box of frozen spinach (I’d asked for fresh… lol?) a couple of weeks ago, so I thought this would be a good opportunity to use it up, so I threw that in the soup with a carrot and some celery, which aren’t in the original recipe. 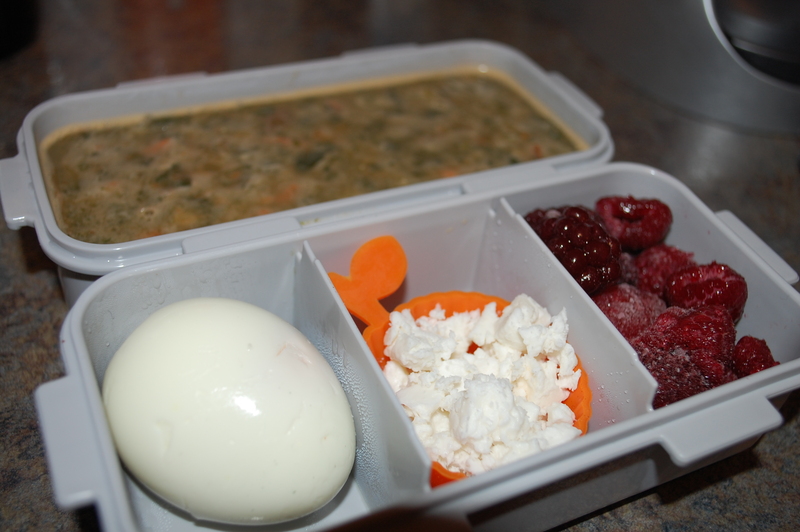 I have some goat feta cheese to add to the soup prior to eating tomorrow, and an egg and frozen berries for sides. They’re not my faves, but my son ate all the fruit when I was away this weekend and didn’t tell me we needed more! I have raw pumpkin seeds and raw cashews for snacks. Deelish! I’m taking this and 11 other cuppies just like it to share at a conference tomorrow. Nom! 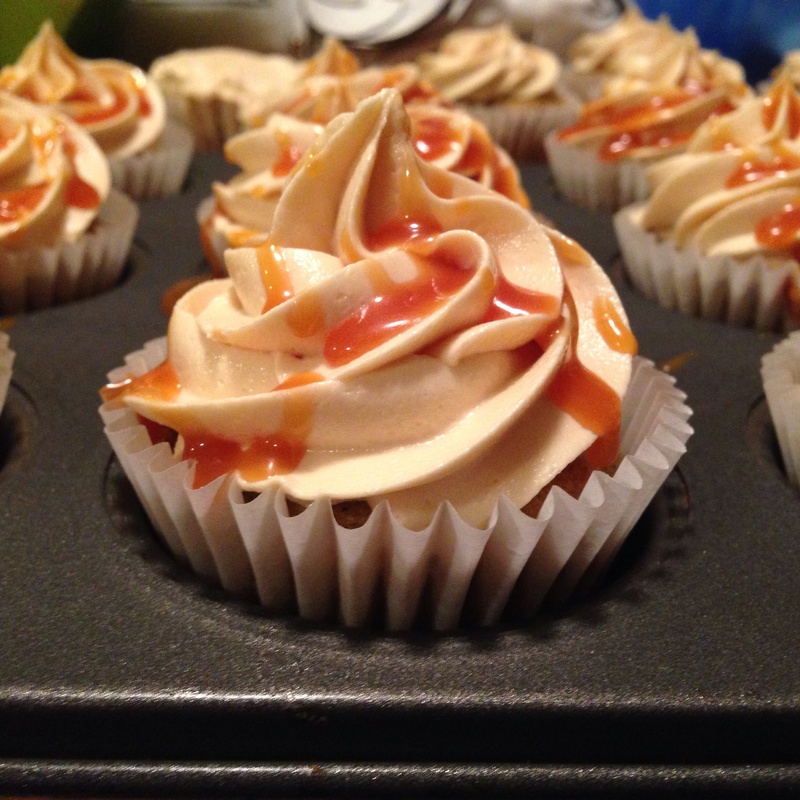 I have pumpkin cupcakes topped with salted caramel icing and more salted caramel drizzle. The recipe comes from: http://www.seebrookecook.com/2013/10/brown-butter-pumpkin-cupcakes-with.html and the only adaptation I made was to reduce the butter to 1/2 cup and to use a gf flour blend (but I’m not telling the cuppie-appreciating masses that they are gf – bad me!). For a change, I actually have a Japanese-inspired bento. I was planning on making a tamagoyaki/rolled omelette, but found that I used the last of the eggs in cupcakes this week. It’s okay, because it’s good to focus on plant-based lunches, and I often have edamame in the freezer. Chickie holds a good pinch of Thai ginger lemongrass salt to sprinkle over the edamame just prior to eating. I included all three bentos in this post, as it shows me making variations on a theme to adjust for everyone’s dietary/sensory preferences. On the left is my lunch for tomorrow. I have brie and tomato on gf sprouted grain bread, and a green salad. The matchstick carrots came in a bag, and I’ll use them for a kinpira-style dish tomorrow, but for now putting them on salad does the trick. The hubs has some sort of deli meat and tomato on a whole wheat bread my son won’t eat as it has some seeds in it and I’m trying to use up, and a green salad. My son has pbj on sprouted grain bread, and he says he’ll do his best with the oat flakes on the crust (as long as I promised to buy non-seedy bread tomorrow on the way home), carrot matchsticks (although he asked for a whole carrot, so let’s see if they actually get eaten), and some apple quarters as he can’t eat salad. I put some semi-sweet chocolate chips in the cupcake cup for him. Osomaddie! 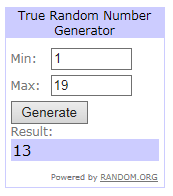 I’ve sent you an email 🙂 Congrats! 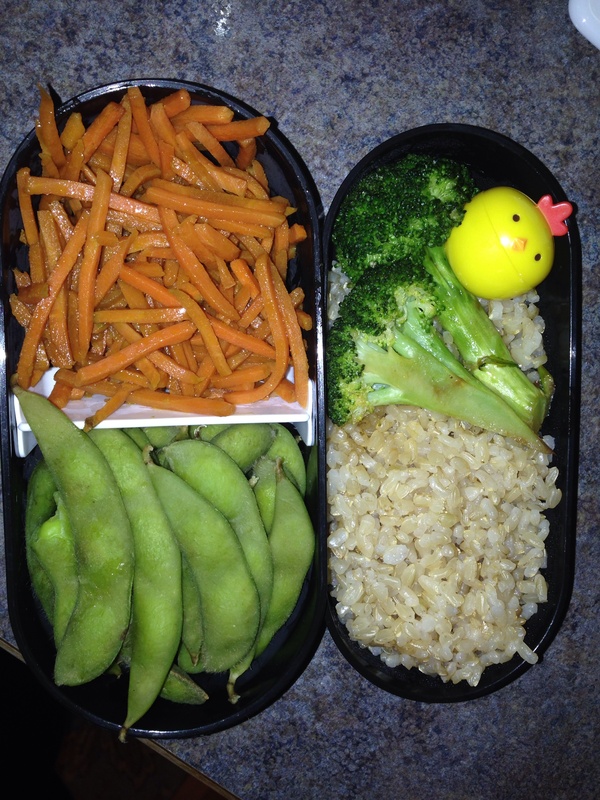 More bento love on Facebook!